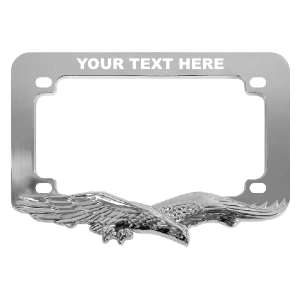 Add the finishing touch to your bike with our Custom Eagle Chrome Motorcycle License Plate Frame. Motorcycle frames are ideal for adding style and protection to your bike's license plate. They make great gifts and come with mounting holes, allowing for quick and simple installation on most motorcycles. The frame offers universal sizing to fit any U.S. issued motorcycle license plate. Custom lettering is made with vinyl decals. We recommend checking your local laws to ensure that the style of the Custom Eagle Chrome Motorcycle License Plate Frame is legal in your state. Some states have special laws that may limit what parts of the plate can be covered or obscured by a license plate frame.